Time to get educated and by that I of course mean Googling. The country is home to just over half a million people and it’s amazingly multicultural. Almost 45% of the population are of foreign background or are foreign nationals with over 15% of Portuguese origin. In terms of language it turns out they speak a bit of everything. Luxembourgish is a language that is closely related to German and is one of the official languages. Children are taught in school both in French and German. The media is mostly German, government matters are usually French and, by the way, English is widely spoken. We experienced this first hand as we sat in cafes and bars in Luxembourg City and heard people switch mid sentence between French, German and English. We stayed at a fantastic campsite just outside the capital. There is a cycle route around the entire city that went right past the campsite, so one sunny day we took our bikes along the river and made our way to the center. The city center is located on a high plateau but fortunately there are lifts that allow you to take bikes up without busting your chops pedaling up the hill. We stored our bikes near the Courts of Justice and explored the city on foot. We found the city, and the surrounding areas, to be immaculate. Luxembourg is a prosperous place. In fact, it has one of the highest GDP per capita in the world and it shows. 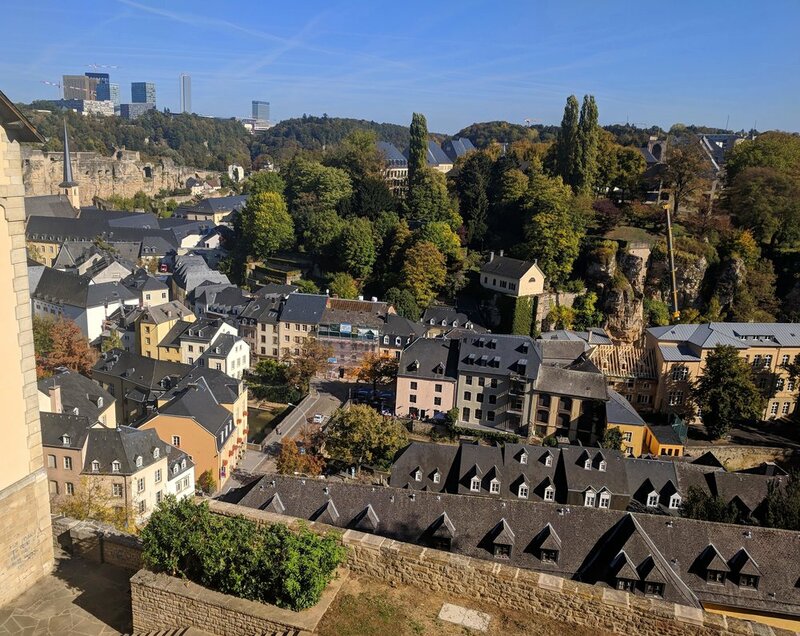 Luxembourg is one of the three European Union capitals (with Brussels and Strasbourg) and is the seat of several EU institutions. We came across an information center where members of the public can come and learn more about the EU. We popped in to chat with the staff. We explained how sad we were about Brexit and our impending loss of EU citizenship. Interestingly, the woman we spoke to told us that they had a constant stream of British people coming in and saying the same thing. We enjoyed our couple of days in Luxembourg. It was our first, and probably will be our only, new country visited in 2018. But time was pressing on and we had a ferry to catch in Calais to take us back to the UK for some motorhome chores and a family wedding. 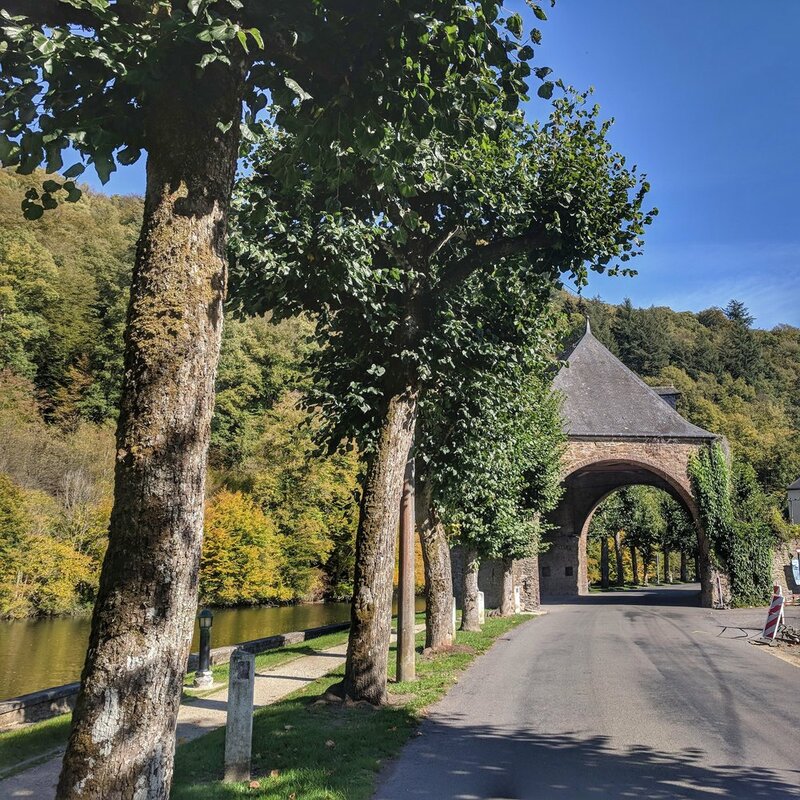 We did a couple of overnight stops on the way in France and Belgium, including the gorgeous town of Bouillon on the Belgian French border where we had another chance to enjoy some delicious Belgian beers. We also made a stop at a French hypermarket to stock up on some cheese and wine before heading back across the channel. As we reached the ferry terminal in Calais we reflected on our summer traveling around Belgium, The Netherlands, Germany and now Luxembourg. We had some fantastic experiences and probably the best weather Northern Europe has seen for over 40 years. We love having the time to truly explore places and move at such a slow pace, especially locations that are not always the first places that come to mind when you think of being a tourist in Europe. We never forget how lucky we are to have chosen this way to live and can’t wait for the next set of adventures.